Dr. Kent Brantly and Samaritan's Purse President Franklin Graham talked about the importance of the medical supplies in stopping the spread of Ebola in Liberia. Protective equipment is vital as Samaritan’s Purse prepares to open community care centers in Liberia to help combat the deadly Ebola virus. But medical supplies are scarce, as many hospitals and clinics around the country don’t even have gloves for their staff. On Wednesday, Samaritan’s Purse sent a 747 cargo jet from Charlotte, N.C., to Monrovia to get desperately-needed supplies into Liberia as quickly as possible. The 90 tons on board the plane will help stock up to 15 community care centers that we plan to build and manage. This includes 100,000 sets of protective equipment, 20,000 buckets, and over 100,000 pairs of gloves essential to protecting our staff and the healthcare workers we are training to operate the centers. The plane is also stocked with decontamination sprayers, disposal bags, and 20,000 absorbent pads. Along with the shortage of supplies, the recent halt of flights in and out of Liberia has presented an additional difficulty in responding to the crisis. 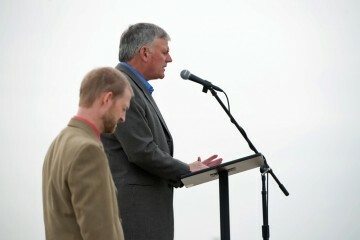 Samaritan’s Purse President Franklin Graham prays that many lives will be saved through the airlifted supplies. 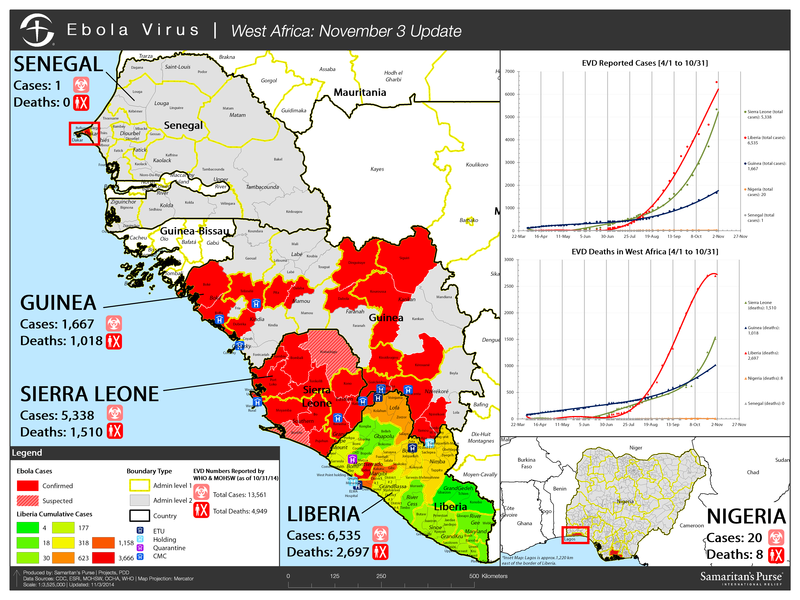 “The clock is ticking in West Africa. People are dying, and they need help,” Samaritan’s Purse President Franklin Graham said. 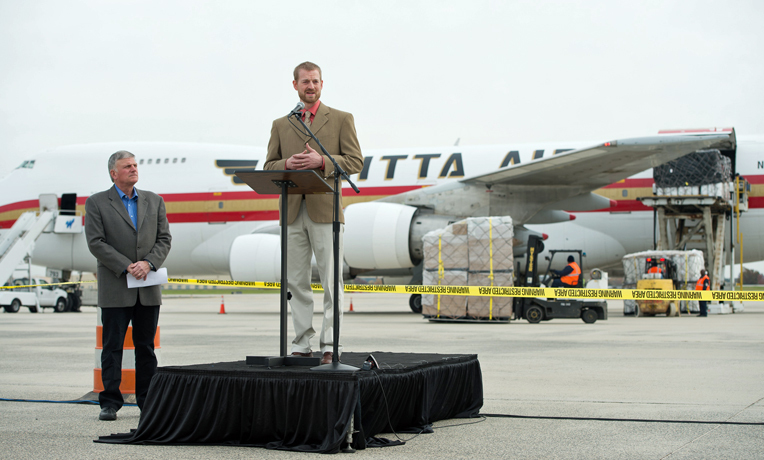 Kent Brantly, the Samaritan’s Purse doctor who survived the Ebola virus he contracted while serving in Liberia, spoke at the airlift on Wednesday at Charlotte Douglas International Airport. Dr. Brantly was treating victims of the Ebola virus disease at our case management center at ELWA Hospital near Monrovia when he contracted the virus. He was evacuated to Emory University Hospital, where he became the first person treated for Ebola in the United States. He has donated blood plasma to other patients since recovering from the virus. Our first community care center in Fishtown, River Gee County is scheduled to open within the week. The community care centers are part of our ongoing effort to stop the spread of Ebola, which has killed more than 4,900 people in West Africa, including over 2,500 in Liberia. In rural areas hard-hit by the virus, we are training Liberians to run 10-bed facilities that provide basic supportive care. Our national and international staff members are managing operations. Two of our centers are nearing completion, with the first one scheduled to open in River Gee County by the end of the week. Educational materials for the centers, such as posters, flip charts, and banners, are also being airlifted with the medical supplies. These printed materials communicate crucial information like how to properly put on the protective equipment, how to take it off and be decontaminated, and a medicine chart for the healthcare workers. Last week, Samaritan’s Purse began distributing Infection Prevention and Control kits as part of our public education campaign. Our teams distributed over 1,500 kits filled with basic hygiene items—gloves, soap, buckets, a disinfectant for hand-washing, and a disinfectant for treating drinking water—and trained over 4,200 people on how to protect themselves from Ebola. Samaritan’s Purse is prepared to build and manage up to 15 community care centers in rural areas hard-hit by the Ebola virus. Overall, we are focused on distributing up to 50,000 kits and educating 300,000 people in high-transmission areas across multiple counties. The 747 is carrying an additional 14,000 pounds of soap for the kits. This is the second airlift Samaritan’s Purse has sent into Liberia in response to the Ebola crisis this year. The first 747 transported supplies for our home-based care initiative and protective kits. The supplies we are sending in now should equip our team to run community care centers for the next six months. At Samaritan’s Purse, our goal is to save lives, ease suffering, and share the love of Jesus Christ. Please join us in praying for the Ebola outbreak to end, for infected people to survive the virus, and for our staff as they respond.